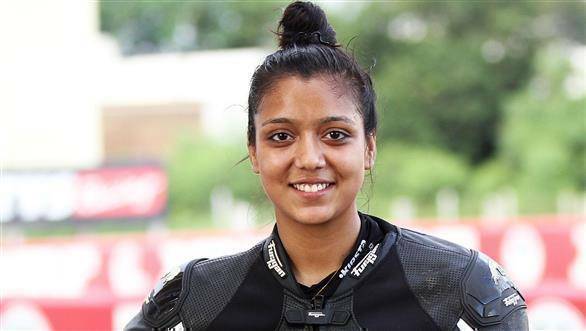 Apex Racing Academy rider from Bengaluru Aishwarya Pissay took the title in the Girls category with a full round to spare at Round 4 of the MRF MMSC FMSCI Indian National Motorcycle Racing Championship at the Madras Motor Race Track in Chennai on Saturday. Aishwarya had finished second during the eight-lap race behind local racer Alisha Abdullah, with Kalyani Potekar in third. It was during post-race scrutiny that Kalyani and her Speed-Up Racing teammate Ryhana Bee were disqualified on technical grounds. With each race win worth 25 points, Aishwarya, with 83 points and a 32-point lead over second-placed Kalyani, took home the title with one round to spare. This is not a first for Aishwarya, who earlier this year, also won the women's category of the Indian National Rally Championship with a round to spare. The thrilled women's champion was at a loss for words when asked about her win. In the premier-class Super Sport Indian (up to 165cc) class, Rajiv Sethu (123 points) of Honda Ten10 Racing maintained his top spot on the leaderboard after finishing second behind defending champion Jagan Kumar of TVS Racing. Jagan's tepid run this season got a much needed shot in the arm with the win. The race witnessed constant lead changes between the two, before Jagan pulled away, taking advantage of the back-markers. Jagan is now in third spot ahead of sunday's double-header, just four points behind Sethu's team-mate Mathana Kumar (101 points) who had a rough day, ending fifth after a collision. 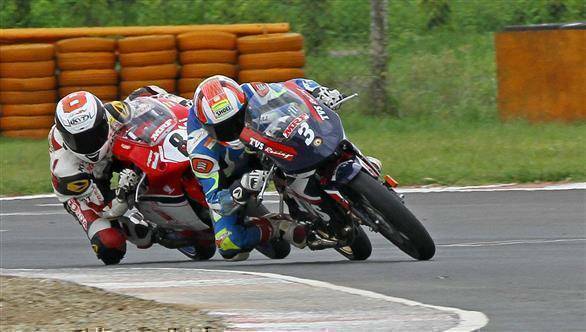 In the Super Sport Indian (300 to 400cc) race, Deepak Ravikumar awon hard-fought battle, trailed by Antony Peter and Amarnath Menon. Menon is currently the championship leader with 140 points, while Ravikumar has 91. There are three races left in the category, including one on Sunday. The Pro-Stock category, which was run on a combined grid with Super Sport Indian (165cc), witnessed drama with both championship contenders, Aravind Balakrishnan (108 points) and Aravind Ganesh (90) crashing out, with no points to show for their efforts. S Sivanesan (Team Alisha Abdullah) took the win after Soorya PM, who had finished first, was disqualified for disobeying a jump start penalty. Prabhu V (Sparks Racing) and Sahay S (Rockers Racing) finishing second and third, respectively.